Bamboo grows in the warm and humid climate of the Asia region. While the availability of natural wood resources have declined overall, bamboo has gained attention as an eco-friendly material due to its fast growth rate. Bamboo is a familiar plant in Japan, as it has had a close relationship with the lives and culture of the Japanese people since ancient times. Bamboo is highly flexible and durable, making it suitable for a wide range of uses from kitchenware to building material. 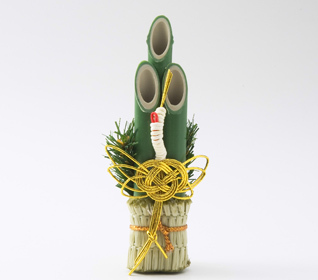 It is also valued as a symbol of good fortune along with pine and plum, and is often used in New Year's decorations such as the "Kadomatsu" pine and bamboo ornament (photo right). Kadomatsu is traditionally placed at the entrance to welcome the new year, and you can see the green bamboo shooting straight up into the heavens. 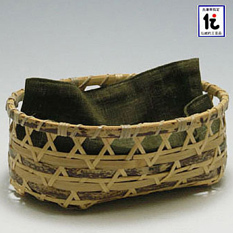 Bamboo has not only been used as everyday tools but has also seen unique developments in the world of art. 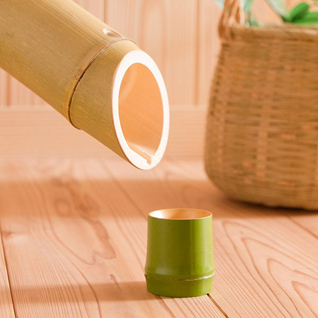 Bamboo is especially essential for utensils used in the tea ceremony, or "Cha-no-yu." 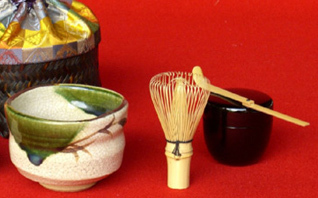 These utensils include the vase to display the flowers of the season, the tea spoon to scoop matcha tea powder from the container, and the tea whisk to make the tea. The famous tea master Sen-no-Rikyu, who perfected the art of tea ceremony, is believed to have preferred the simplicity of bamboo utensils. It is believed that there are several hundred species of bamboo in Japan alone. Bamboo that grows in Kyoto are especially valued as "Kyo-mei-take" (fine bamboos of Kyoto), and include species of bamboo with sesame patterns ("Goma Take") and tortoise-shell patterns ("Kikko Take"). 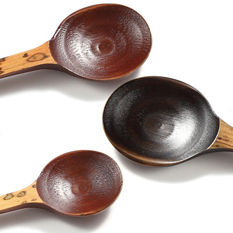 You can enjoy the change of color in natural bamboo products as they change with time from green to shiny caramel. 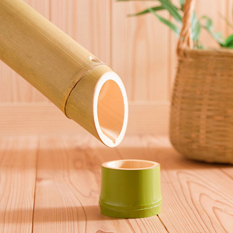 Bamboo is often used to make eating utensils such as sake flasks and cups, as it has high anti-bacterial and anti-odor qualities. By using such utensils, you can enjoy the exquisite taste of Japanese sake which is enhanced not only by the fragrance of bamboo but also by its visual aesthetic. While bamboo is often associated with Japanese styles, it also suits western styles as well, and you can easily enjoy the modern feel of bamboo by placing it in your room. The Japanese people have long valued the beauty of nature. 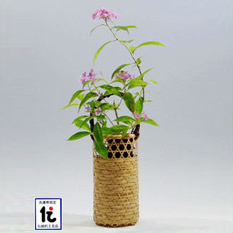 Why not include this Japanese aesthetic in your daily life?